If you need a new workhorse laptop, Newegg has a nice deal on a 15.6-inch Asus VivoBook for $480. Let’s finish off the week with a deal on an affordable laptop that packs some punch. Newegg is selling a Core i5-equipped Asus VivoBook for just $480 today. The sale ends just before midnight on Friday Pacific time, and it’s a good $100 cheaper than you’ll find at Amazon and other competitors online. This Windows 10 laptop revolves around some impressive specs for a budget notebook, with 2.5GHz Core i5-7200U processor, 8GB of RAM, and a 1TB hard drive. The 1366-by-768 display resolution is a bit low, but dropping below 1080p probably helped Asus keep the price down while still including such solid internal hardware. For ports, the VivoBook has a little bit of everything: one USB 2.0, one USB 3.0, and one USB Type-C. There’s also an ethernet jack, HDMI out, and even VGA out, because legends never die. Bluetooth 4.0 and 802.11b/g/n Wi-Fi wireless connectivity also lurk inside. Finally, there’s an SDXC card reader. 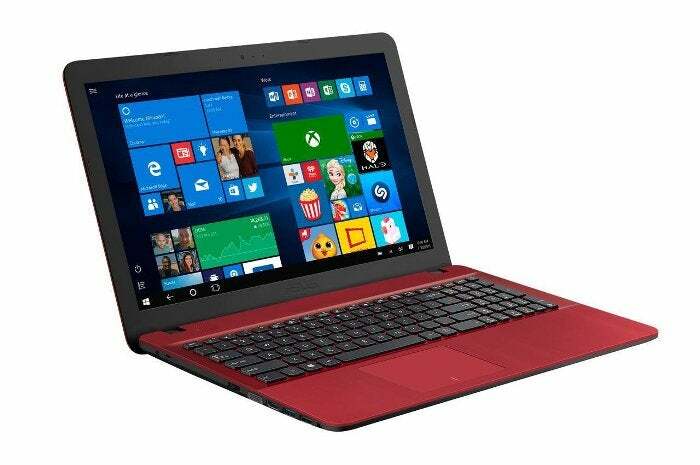 The bright red laptop weighs 4.41 pounds, which is just under the five-pound comfort limit for weight. It’s also fairly thin but not excessively so at 1.09-inches. If the Asus VivoBook doesn’t catch your fancy, Staples is offering a Lenovo IdeaPad 320S with nearly identical specs for $500, a $220 discount off its listed price. The laptop includes a much faster (yet more capacity-constrained) 256GB SSD instead of the Asus notebook’s 1TB hard drive. Lenovo’s IdeaPad also features a slightly smaller 14-inch screen, and it comes in “platinum silver,” not red.